Munich - FC Bayern Munich did the Bundesliga proud with a dazzling Doha display against fellow top-flight ambassadors FC Schalke 04 on Tuesday night. If anything, the Bundesliga leaders looked even more determined following two weeks' rest as they surged into a 4-0 half-time lead courtesy of Thomas Müller (2) and Mario Mandzukic (2), before substitute Mario Gomez got in on the act on an entertaining evening in the Qatari capital. Put simply, Bayern were a class above their Royal Blue counterparts, with the usual suspects of Javi Martinez, Bastian Schweinsteiger, Franck Ribery and Toni Kroos looking as fresh and clinical as ever in their first real test under the Middle East sun. The fluidity with which the Bavarians moved the ball was frightening at times and perhaps best evidenced by Ribery's scintillating first-half performance. The Frenchman laid on both goals for Mandzukic following two trademark runs, typical of his sterling season so far. What started out as pockets of Bayern fans in the making soon became masses of Bundesliga enthusiasts, with chants of "Bayern, Bayern, Bayern", spreading through the stands. It was only half-time, but in some ways it was already mission accomplished. 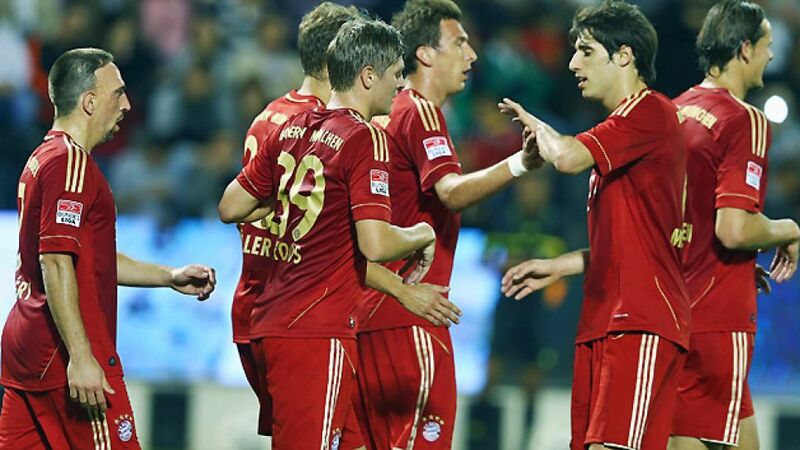 Bayern were leading, their popularity soaring and talk of "Bundesliga is best" rolling off the Doha tongues. Jupp Heynckes rang the changes at the break, with the second-half squad sheets nevertheless reading like a who's who of Bundesliga stars - both present and future. With Arabic appetites suitably whetted, it was time for dessert. Xherdan Shaqiri introduced himself to those fortunate enough to be in attendance, teeing up Gomez for Bayern's fifth, before Arjen Robben took over captain's duties from Schweinsteiger with the result long in the bag. For their part, Schalke came to represent and they did just that. It just so happened they came up against the red machine showing no let-up in their quest to take back what they feel is rightfully theirs this coming summer. While Bayern were victorious on the night, the Bundesliga was the real winner as two of Germany's top clubs captured the imaginations of a brand new audience with a typically competitive, typically Bundesliga performance.